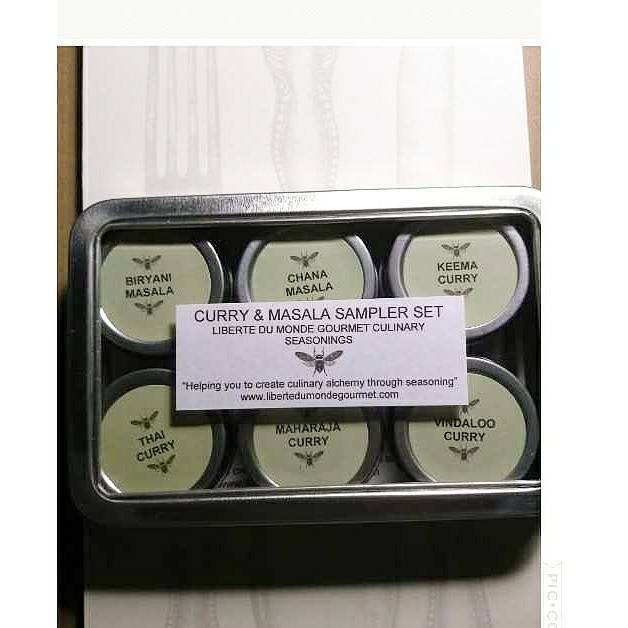 This a set of international Curry & Masala Blends. 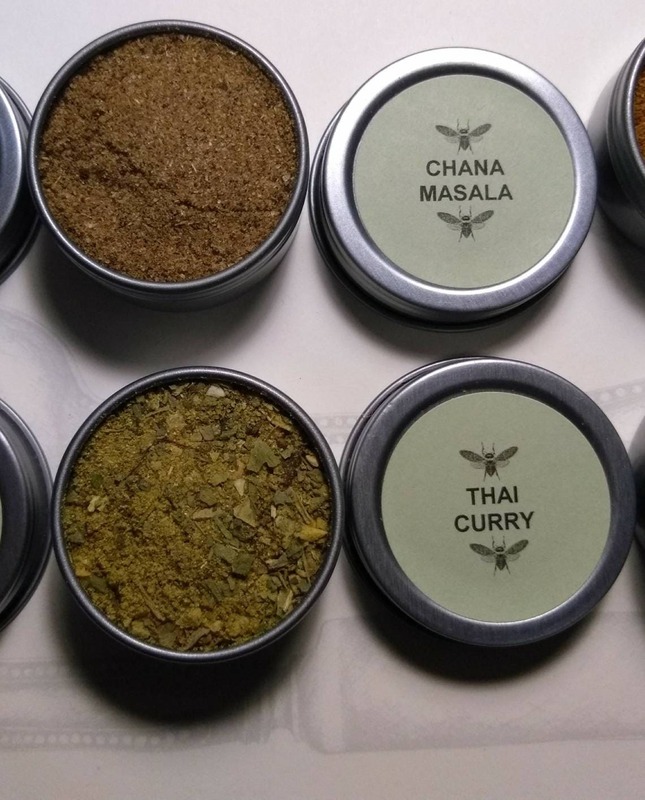 So much flavor in each 1/2 oz food safe tin. Each tin will season a 16 oz or 2 serving recipe. There is simple directions, heat level and origin card included in the rectangular metal box with clear plastic window in the top. All ingredients are also listed on the box. If you try them and like them, they are all available in larger sizes in my shop as well. This makes a great set for those looking to try new things, gift to a friend or a housewarming present. 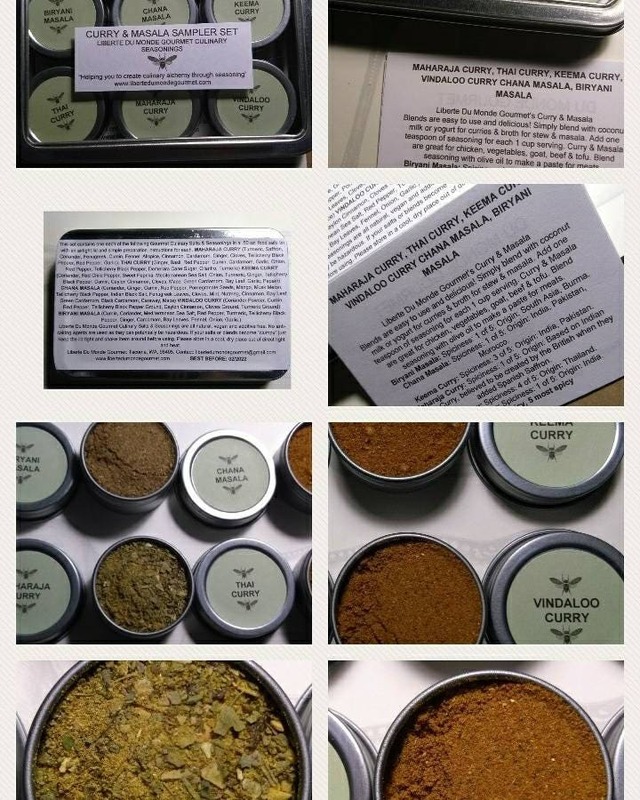 Biryani Masala: INGREDIENTS: Cumin, Coriander, Mediterranean Sea Salt, Red Pepper, Turmeric, Tellicherry Black Pepper, Ginger, Cardamom, Bay Leaves, Fennel, Onion, Garlic. Chana Masala: INGREDIENTS: Coriander, Ginger, Cumin, Red Pepper, Pomegranate Seeds, Mango, Musk Melon, Tellicherry Black Pepper, Indian Black Salt, Fenugreek Leaves, Cloves, Mint, Nutmeg, Cinnamon, Bay Leaf, Green Cardamom, Black Cardamom, Caraway, Mace. Keema Curry: INGREDIENTS: Coriander, Red Chile Pepper, Sweet Paprika, Mediterranean Sea Salt, Onion, Turmeric, Ginger, Tellicherry Black Pepper, Cumin, Ceylon Cinnamon, Cloves, Mace, Green Cardamom, Bay Leaf, Garlic, Papain. 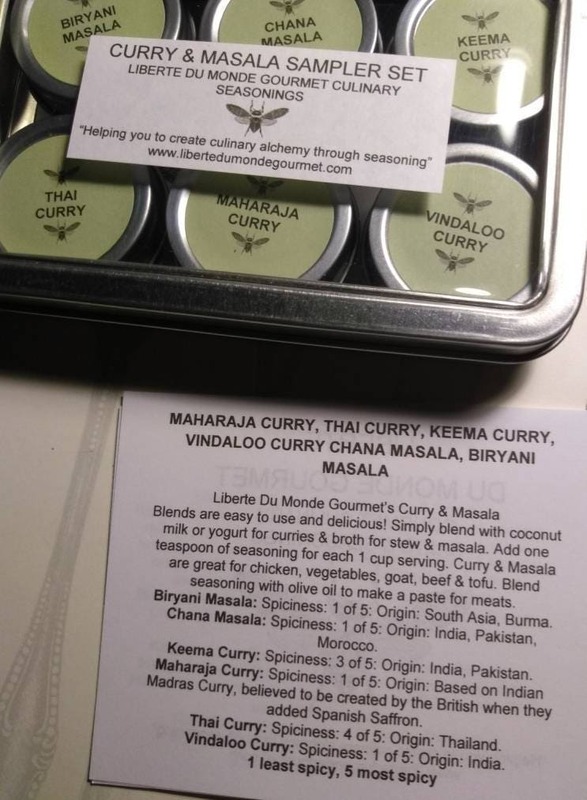 Thai Curry: INGREDIENTS: Ginger, Basil, Red Pepper, Cumin, Cardamom, Garlic, Onion, Thai Chili Pepper, Tellicherry Black Pepper, Demerara Cane Sugar, Cilantro, Turmeric. 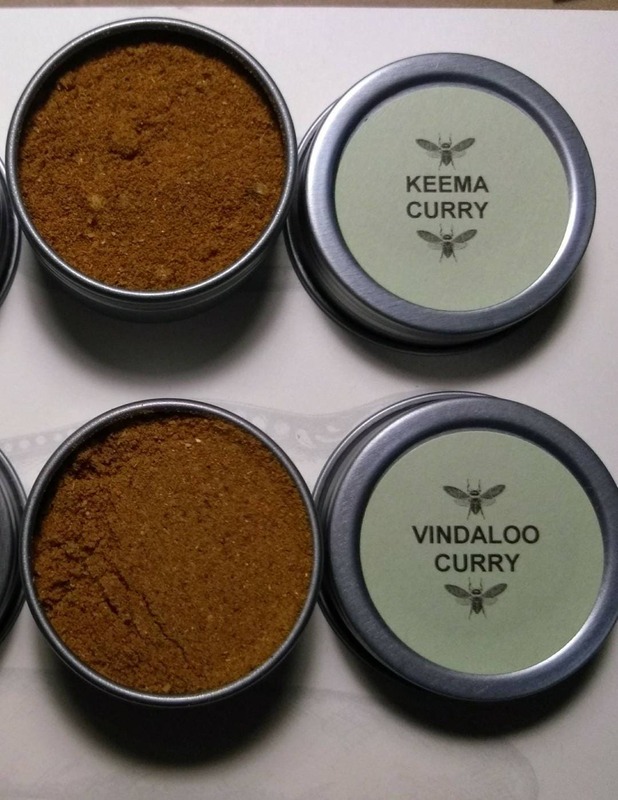 Vindaloo Curry: INGREDIENTS: Coriander Powder, Cumin, Red Pepper, Tellicherry Black Pepper Ground, Ceylon Cinnamon, Cloves Ground, Turmeric Ground.